Presentations that enhance engagement, understanding and acceptance. 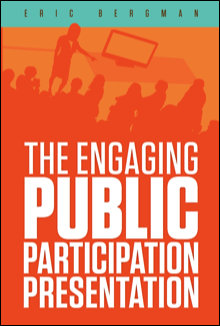 Whether your goal is to inform, consult, involve, collaborate or empower, this two-day workshop will help your people achieve their public participation objectives by enhancing their ability to communicate clearly, concisely and effectively. Help technical experts enhance their confidence and their ability to deliver engaging, effective presentations. Help everyone in the organization manage real or perceived hostility in public meetings. Clarify the audience on the basis of demographics and, more importantly, the shared opinions they possess. Define the business and communication objectives that the presentation is designed to support. Develop clear, concise content that supports audience needs and business objectives. Deliver content in a relaxed, conversational manner that is consistent with the values of IAP2. Answer questions clearly and concisely throughout the presentation, as a means of enhancing engagement, understanding and support. Participants not only develop presentations, they deliver those presentations numerous times during the workshop. They are video recorded and critiqued. Areas of strength are highlighted, and suggestions for improvement are made. Throughout the workshop, participants gain communication insights that can potentially enhance every aspect of their personal and professional lives, from learning to listen well to answering questions effectively. Contact us to learn how your organization can schedule a communication workshop to bring your public participation process to life, or to determine whether we’re conducting a “public” workshop near you.